Thursday, Oct. 13, 7:00 pm, O.B. 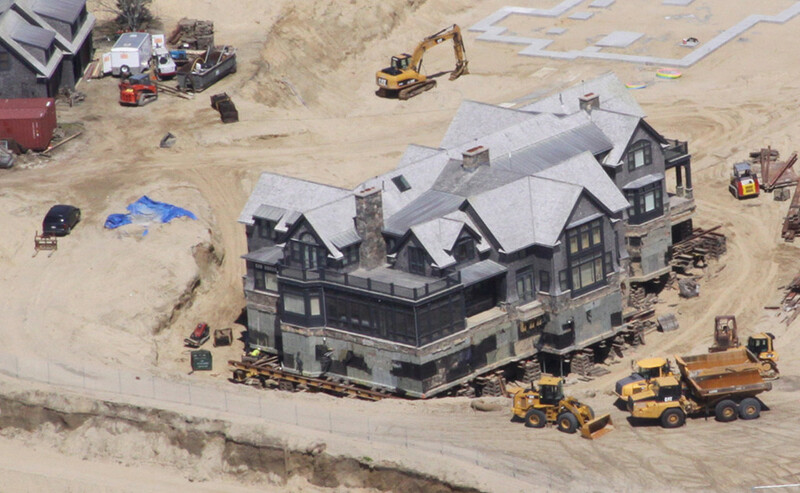 A free showing of MV Film Festival founder Thomas Bena's own documentary film, One Big Home, followed by a discussion of the issues surrounding trophy homes. At the Performing Arts Center (next to the high school), for more info and to reserve a free ticket see website. For the VCS perspective, see this previous Almanac. Wednesday, Oct. 19, 4:00 to 5:00 pm, Edgartown. As the featured guest for the MV Chamber of Commerce's "State of the Vineyard" event, MVC Executive Director Adam Turner will present statistics illustrating the socio-economic, demographic, and environmental trends affecting our island. At the Harbor View Hotel's Menemsha Room, free, but RSVP via email or call (508) 693-0085. Saturday, Oct. 22, 9:00 am to 2:00 pm, Oak Bluffs. Many electronic devices and appliances contain toxic chemicals that can be harmful if not disposed of properly -- and getting rid of them at the dump is expensive! Free yourself of burdensome junk at MV Community Services, across the street from the high school. Fees range from $2 - $30 per item (10% discount for carloads) and benefit MVCS. For more info, see website or call (508) 693-7900 ext. 267. Saturday, Oct. 22, 10:00 am to noon, West Tisbury. Join Sheriff's Meadow staff for a walk through their largest sanctuary. The trails at Cedar Tree Neck cover diverse terrain including groves of beech trees and pines, ridges with ocean views, beachfront, windswept headlands, freshwater ponds and sphagnum bogs. It will be a strenuous walk, so bring water and wear suitable shoes. Free, more info at website or (508) 693-5207. 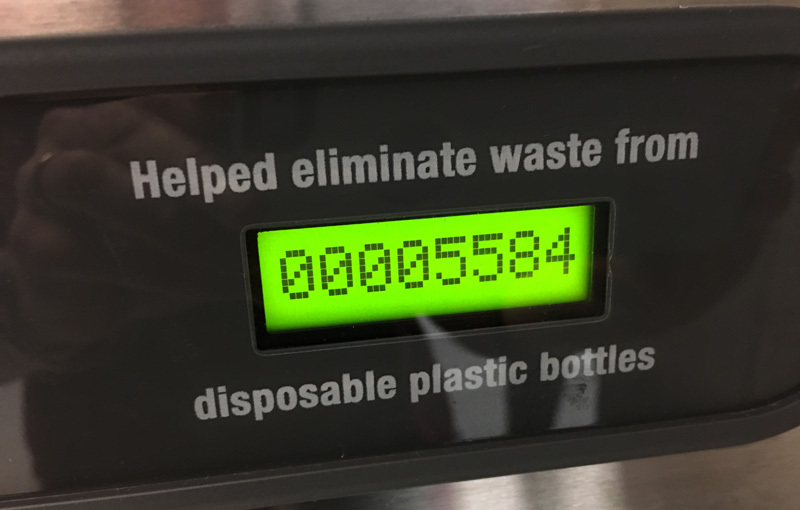 Congratulations to the students of the MV Regional High School, who together have saved over 8,000 disposable water bottles from the waste stream since the recent installation of two bottle refilling stations at the school. 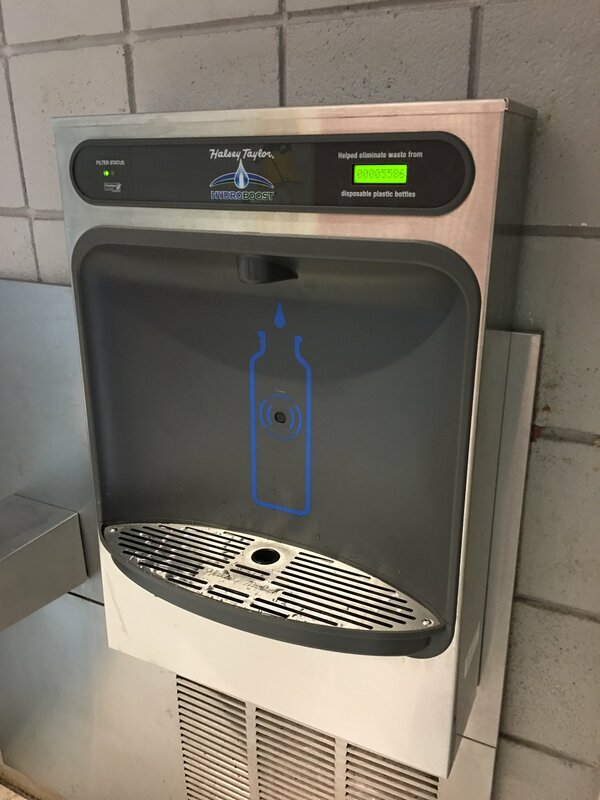 The machines, which dispense cold, filtered water similar to a traditional water fountain, are so convenient that now almost every student is carrying a reusable water bottle. VCS is attempting to expand our plastics reduction campaign from the recently passed plastic bag ban to find creative solutions that actively reduce pollution and waste. Schools are an especially sensible place for these bottle filling stations because not only are they saving many plastic bottles a day, they are instilling a positive sense of pride in reducing waste for young people. The first two filling stations were installed over the summer as a pilot program to test the waters, and so far it has been hugely popular – we now hope to secure funding to take the project Island-wide! As the tumult of summer slips back in our collective rearview mirror, the cooler, calmer air of early fall prompts some consideration of whether our Island quality of life — sometimes cynically marketed, but always sincerely valued — is under threat. Let’s leave the really heavy stuff — the almost impossibly complex challenges like climate change, housing shortages, and diversifying an economy overly reliant on the building, buying, and beautification of second homes — for another time, and just consider one issue that we can all agree is a problem: summer traffic. As the Selectmen, Planning Boards, and Housing Committees of all six towns are busily developing “Housing Production Plans” to address the Island’s housing shortage, the All Island Planning Board has recently created an online survey to gauge public opinion. There is quite a lot at stake in this process, so VCS would like to echo the statement on the MVC’s website inviting you “to help shape the future of the Island.” If you can, attend the public meetings (schedule here) for your town’s Housing Production Plan. But if you can’t – and there are many folks for whom this is just not feasible – take the survey! VCS has long believed that there is no need for conservation and affordable housing to be in conflict. Smart growth – locating new housing within walking distance of jobs, schools, shopping, and public transportation – adds vibrancy to the community in places where density already exists, rather than clearing forests, displacing wildlife, and fragmenting what habitat remains. We can dispel the myth of a perpetual conflict between growth and conservation, but to do it we must learn to grow smart. Last month, NASA announced that August was Earth’s single hottest month since 1880, the beginning of the modern system of climate records. That’s part of a broader pattern in which 2016 is shaping up to be the hottest year on record, and the third such record-breaker in three years. That well-worn graph of yearly global temperatures, which usually only reveals a steady upward climb when viewed on a scale of several decades, now looks more like a year-to-year staircase.